in downtown Vancouver • We’re building community one dance step at a time! The concept was born in 2015 just after the opening of Sam’s Dance. The idea behind Dance in Transit was to dance in public spaces, including on skytrains and in stations. We wanted to engage people passing by and show them how easy and fun dancing can be. 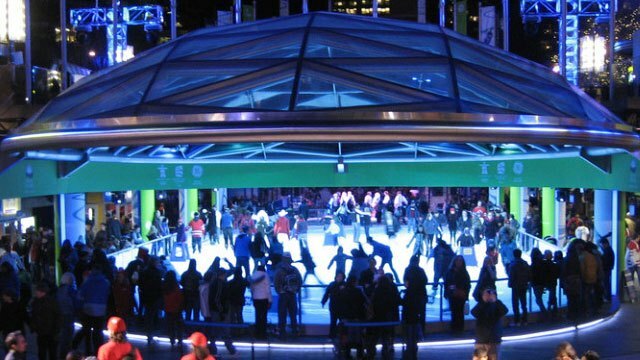 After two years of working on the concept and testing it, we finally secured the use of Robson Square. 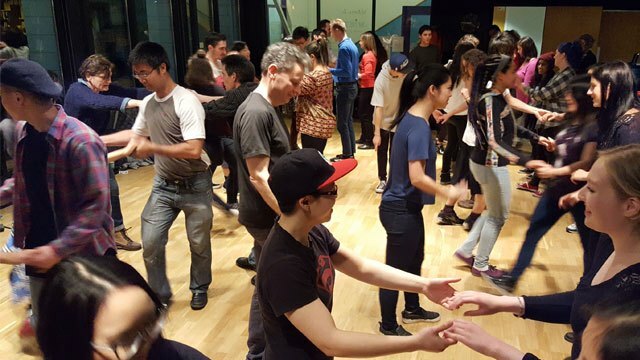 At the same time, we decided to try other amazing venues so we could reach people in different parts of the downtown core and experience dancing in different settings. Sam’s Dance is perfect for people who want to learn to dance and dance all year long in the comfort of an indoor venue. With Dance in Transit, Sam’s Dance is bringing its philosophy of inclusiveness and diversity outside and inviting everyone to join us for a spring and summer of fun. Dance in Transit is our way of saying thank you to Vancouver’s dance community and inviting everyone to join this vibrant group of movers and shakers. It’s also a chance to showcase the best our city has to offer in spectacular surroundings. We’re the Pied Pipers of Dance. 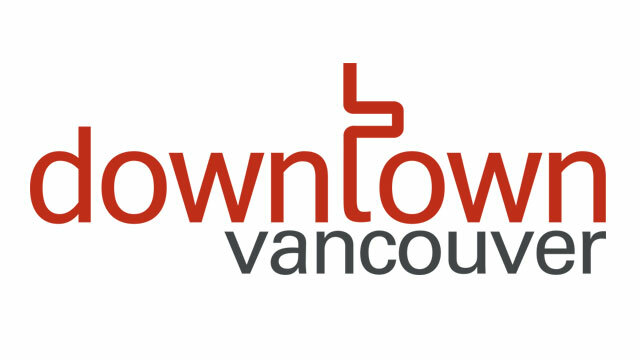 If you follow us, we’ll lead you on a merry journey to the most spectacular spaces in downtown Vancouver for dancing, music, friendship, & fun! We think what the world needs now is more Canada. We’re leading the way with Dance in Transit to show off Vancouver as the most accepting, diverse, multi-cultural city in the country. We invite you to join us for some social connection that could change your life. All of us can use more friends. Most of us can use more excitement in our lives. Many of us would benefit from more movement. Social contact is good for everyone, even introverts. Dance in Transit will provide all this and more. 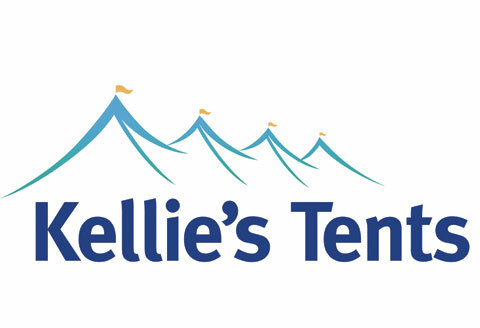 It will give dancers the chance to practice and show off their skills to friends and newcomers. It will introduce non-dancers to the joy of dancing. Dancing is proven to benefit the body in many ways. It is also scientifically proven to be better for our brains than any other activity, including yoga, crossword puzzles, and crossfit training. Dancing relieves stress, provides an outlet for creative expression, and improves balance and coordination. Dancing makes you happy! Dance in Transit is designed to reach thousands of people, both locals and tourists, and invite them to experience this amazing event with us. 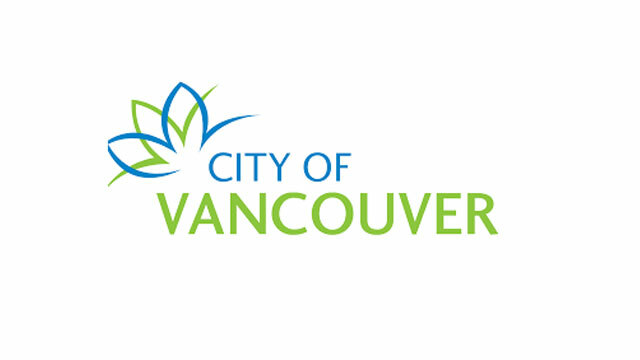 We hope to engage people in this MOST FUN summer Vancouver has ever seen. We hope you will leave your homes, put down your digital devices, and join us to Dance Your Pants Off! If you think dancing isn’t for you, you haven’t tried it yet. Everyone can dance at some level that brings them joy! Dance in Transit is a street dancing festival—it’s not about wearing special clothes or fancy shoes, it’s about moving to music, one foot at a time. It’s safe, healthy, good for your brain and body, & it will make you feel alive! 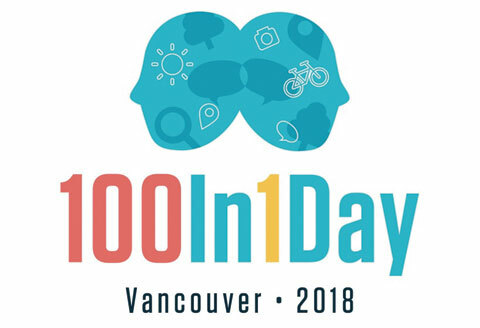 This will be the longest, largest dance event in the history of Vancouver. 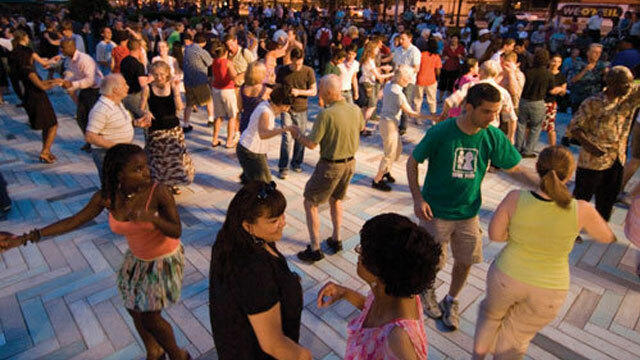 Dance in Transit is FREE outdoor dancing in magnificent downtown venues. 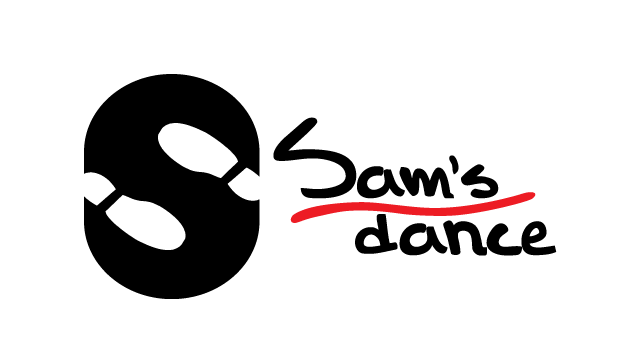 Dance in Transit will feature many dance styles and will include mini-lessons, demonstrations, performances, music, & lots of social dancing. It will be a chance for dancers to learn new styles, practice the styles they already know, and experience these venues in the fresh air while moving to the best music made for dancing. It is also an opportunity for non-dancers to see what social dancing is all about, to try it, to feel what dancers feel in an open, no-pressure environment. Everyone who attends will feel like a part of this movement because one of our jobs is to make sure of that. Check out our schedule of dates, times, & venues. We hope to see you on the dance floor! Do you know HOW good dancing is for you? Why dancing? And what kind of dancing? Below street level in front of the Vancouver Art Gallery, at Robson & Howe, sits a jewel in the heart of Vancouver. This beautiful space sports a smooth, polished concrete floor & overhead covering that makes it perfect for outdoor dancing in rainy Vancouver. 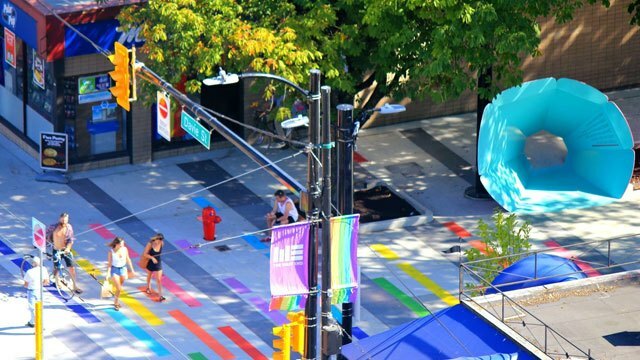 Follow the rainbow crosswalk at Bute on Davie Street & you’ll discover this oasis in the hub of Vancouver’s West End. Trees, benches, & the buzz of Davie Street make this unique space both lively & fun. We have tents when the weather doesn’t cooperate! 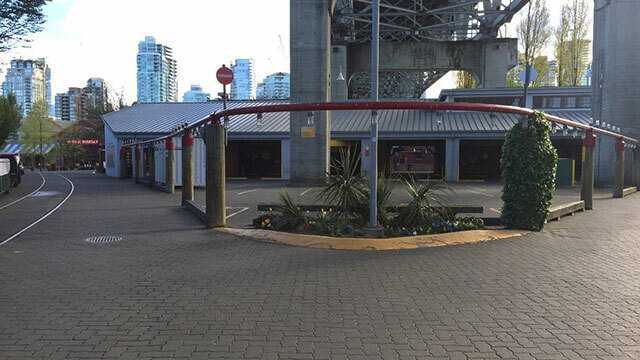 Directly under the Granville Bridge (1404 Anderson Street), this new space on beautiful Granville Island is perfect for outdoor dancing. Enter the Island and it’s straight ahead, enclosed by a bright red railing! The big white tent will provide cover if it rains! 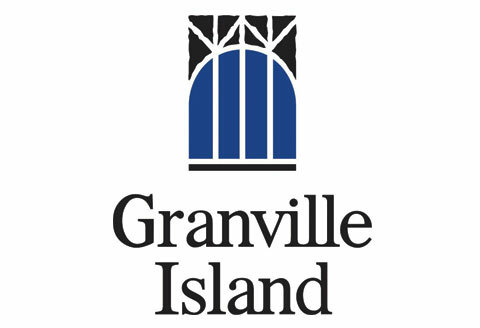 We will be participating in a number of fun festivals in Vancouver during the spring & summer. 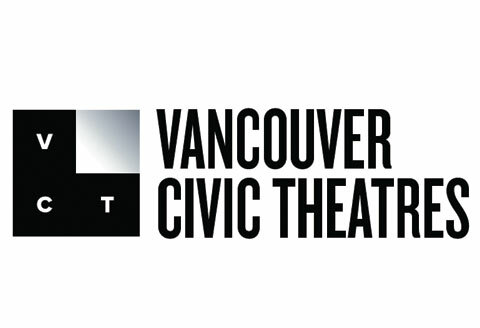 Check our events schedule, which we will be updating regularly, and LIKE our Facebook page @danceintransitvan to keep in touch with where, what, and when. You already know why!! 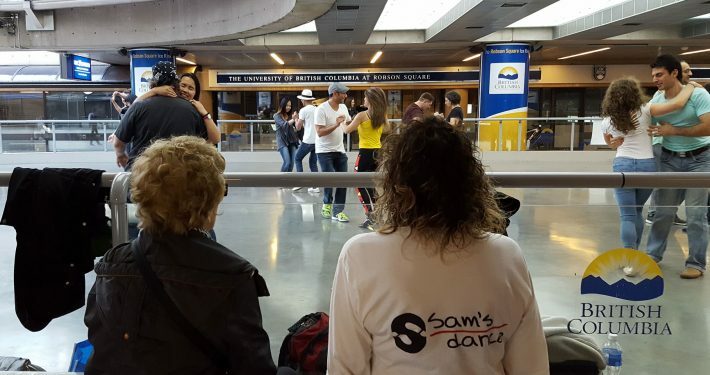 Sam’s Dance school started three years ago as an idea to change the face of social activity in Vancouver. 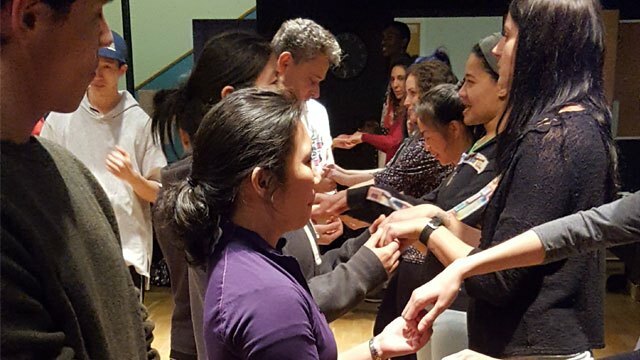 We are change-makers who work to build community, encourage engagement, and reach out to non-dancers as well as those already in the dance community. We believe that dancing is a way to connect with people that we need now more than ever. Dance in Transit is a project of Sam’s Dance. 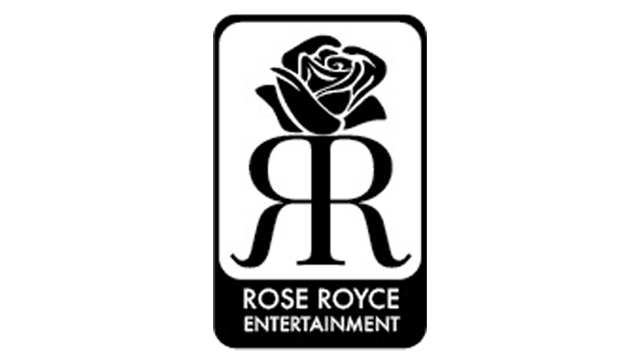 With two decades of experience in the music industry, Rose Royce Group specializes in DJ and musical services, event hosting and management, and dance programs. 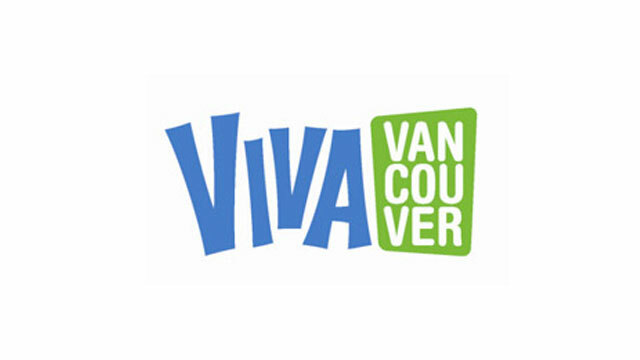 Past events include Viva Vancouver on Granville Street downtown and Carnaval del Sol. Originally from Montreal, Nick Guarna has lived in Vancouver for 8 years. Operating as a non-profit organization since 1972, VWHC has been helping women and families access health care and wellness programs for decades. 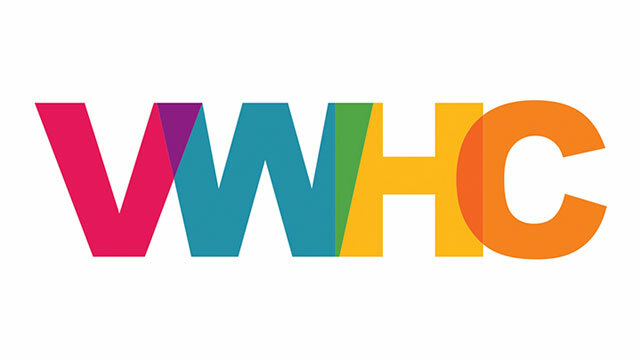 VWHC is committed to exploring the intersection of health and the arts. Since dance has been proven to be better for our bodies and brains than any other activity, VWHC is pleased to partner with Dance in Transit to promote dancing for everyone!